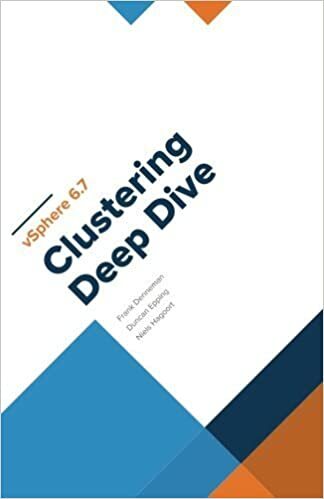 Over the past couple of months Frank, Niels and I have worked ferociously to update the vSphere Clustering Deep Dive. Some of the material was already brought up to date to vSphere 6.0 U2, but the majority was never updated after vSphere 5.1. As you can imagine, this was a tremendous undertaking. Not only did we need to validate every sentence, all diagrams needed to be updated, and with the introduction of the HTML-5 Client also all screenshots had to be retaken. Now, just a couple of weeks before VMworld, we are finally at the point where we can press “publish”. We also have a chapter on stretched clusters, in this chapter we describe how to design and implement a vSphere Metro Storage Cluster, leveraging all of the knowledge gained in the previous chapters. For your convenience I copied/pasted some of the Amazon info below. I hope all of you will enjoy the book as much as we enjoyed writing it. And before I forget, I want to thank my co-authors for the late night discussions, the hard work, insights and fun/laughter at times. Get it while it is hot,buy it from Amazon here. I had a question this week and I thought I wrote about this before but apparently, I did not. Hopefully by now most of you the I/O scheduler has changed over the past couple of years. Within ESXi, we moved to a new scheduler, which often is referred to as mClock. This new scheduler, and a new version of SIOC (storage i/o control) also resulted in some behavioral changes. Some which may be obvious, others which are not. I want to explicitly point out two things which I have discussed in the past which changed with vSphere 6.5 (and 6.7 as such) and both are around the use of limits. First of all: Limits and SvMotion. In the past when a limit was applied to a VM, this would also artificially limit SvMotion. As of vSphere 6.5 (may apply to 6.0 as well but I have not verified this) this is no longer the case. Starting vSphere 6.0 the I/O scheduler creates a queue for every file on the file system (VMFS), this to avoid for instance a VM stalling other types (metadata) of IO. The queues are called SchedQ and briefly described by Cormac Hogan here. Of course, there’s a lot more to it than Cormac or I discuss here, but I am not sure how much I can share so I am not going to go there. Either way, if you were used to limits being applied to SvMotion as well you are warned… this is no longer the case. Secondly, the normalization of I/Os changed with limits. In the past when a limit was applied IOs were normalized at 32KB, meaning that a 64KB I/O would count as 2 I/Os and a 4KB I/O would count as 1. This was confusing for a lot of people and as of vSphere 6.5 this is no longer the case. When you place a limit of 100 IOPS the VMDKs will be limited at 100 IOPS, regardless of the I/O size. This, by the way, was documented here on storagehub, not sure though how many people realized this. Think about that for a second, if you have never seen it I bet you don’t know what it is about? Not strange as the message doesn’t give a clue. f you go to the event however there’s a big clue right there, and that is that the swap file can’t be extended from 0KB to whatever it needs to be. In other words, you are probably running out of disk space on the device the VM is stored on. In this case I removed some obsolete VMs and then powered on the VM that had the issue without any problems. 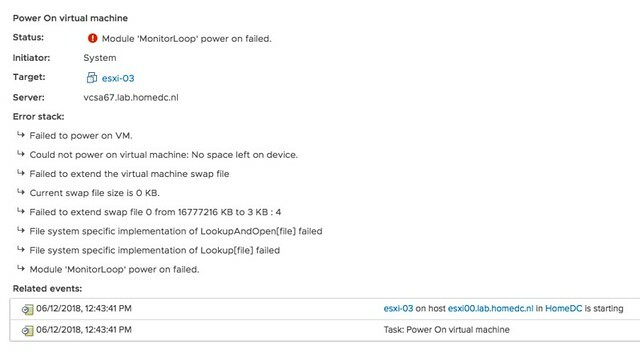 So if you see this “Module MonitorLoop power on failed when powering on VM” error, check your free capacity on the datastore the VM sits on! Strange error message, for a simple problem. Yes, I will file a request to get this changed. I have this issue regularly where the OSX audio stopped working on my Macbook. I am using High Sierra right now, but had the same problem with Sierra. Not sure what is causing the problem, and not sure how to prevent it from happening. I have figured out though how to solve it, and as occasionally I find myself searching for the solution I figured I would quickly document it on my own blog. If your audio has stopped working you can simply stop the service responsible for it. I hope this helps others as well running in to the same problem. If you have and you solved the problem in a different way please leave a comment.